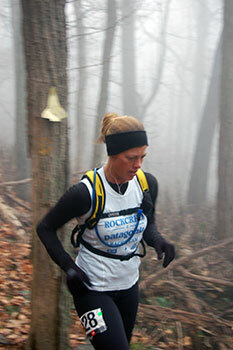 Several Rock/Creek Race Team members finished strong at last weekend’s Mountain Mist 50k in Huntsville, AL. The women stole the show: Kris Whorton finished 1st in her age group, 3nd women’s and 25th overall. Wendi Parker-Dial finished 2nd in her age group, 2nd women’s and 16th overall. Congrats to Patricia Smith for winning the women’s division and placing 14th overall. (Patricia actually has raced with Jim Farmer under the Rock/Creek banner in past adventure races). Jaclyn Greenhill finished 3rd in her age group, 5th female and 41st overall. As for the men, Jamie Dial focused on pacing his wife Wendi but finished with a respectable 9th for his age group, 17th overall. Michael Green finished 11th in his age group, 23rd overall. Our friend Stephen Smith finished 3rd in his age group, 18th overall, in his first official ultra.